Monthly wall calendar offers detailed monthly planning with ample writing space and a full-year calendar reference at the bottom of each sheet. One-page-per-month format includes daily blocks, Sunday-through-Saturday scheduling, numbered weeks, count of days/days remaining, holidays and moon phases. Holiday dates are highlighted in red. Current month is shaded for easy identification. Planning pages range 12 months from January to December. 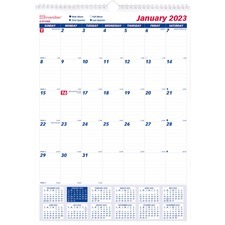 Calendar has reinforced chipboard backing, twin-wire binding and an eyelet for easy hanging.